Over the years, Crossfields has acquired extensive knowledge and experience on various business processes and IT solutions by successfully delivering solutions for many different industries and businesses. Today, we specialize in consulting services for solutions on both industry-specific and business-specific processes. Managing projects for improving operations and introducing systems is an extremely important factor that can decide the success or failure of a project. The “Project Management Support” provided by Crossfields is tailored to meet the client’s specific needs, while ensuring that good communication and governance is maintained and leading to the success of the project. - We work with each client to implement necessary and appropriate project management from the client’s perspective. - We provide systems that are appropriate for the scale and content of each project. - We perform roles (project leader, secretariat, subteam leader, etc.) tailored to the needs of each client. 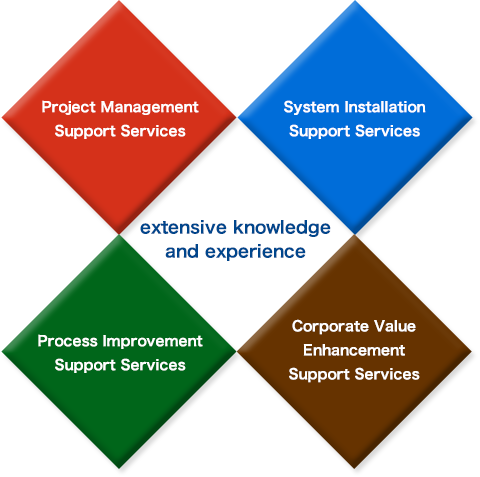 “System Installation Support Projects” include a diverse range of project implementation systems and operating methods depending on the functions of the system to be introduced, the range of usage (required operations, number of users), and whether package systems are also part of the solution. In addition to providing the optimal services for the client or project status, Crossfields’ highly-experienced consultants provide “System Installation Support” that includes continuous support from start to finish to ensure that systems are successfully introduced. - We provide a rich lineup of services tailored to each project type (planning, installation, maintenance). - From basic concepts to installation and maintenance support, we provide continuous support services in all project phases. - From PMO to user work support, we respond in accordance with each client’s needs. The aim of process improvement is to enhance so-called operational QCD (Quality/Cost/Delivery). In addition to identifying the content of the operational quality that the client should seek (effectiveness, accuracy, appropriateness, etc. ), the key to success is achieving a balance between quality, cost, and delivery. At Crossfields, we are constantly aware of these factors in the processes targeted for improvement, and we promote process improvement while undertaking thorough communication with process owners and other stakeholders. - We provide services by fully utilizing our experience accumulated through our process improvement performance (SSC, internal controls, budget management, etc.). - Services are provided by consultant teams that are highly knowledgeable in both operations and systems. - We provide continuous support, from consideration of process improvements through to the implementation and establishment of measures. Companies seek to achieve continuous growth, while also modifying and expanding their business activities, services, and/or products at the same time. However, increasing business diversity and complexity makes it difficult for companies to have a clear overall picture of their operations, causing uneven distribution of management resources, which may lead to a decline in corporate value. The “Corporate Value Enhancement Support” provided by Crossfields firstly identifies existing problems with operational management, and then based on the client’s situation, reconstructs the company’s operational management so that it contributes to the enhancement of corporate value. - We construct a foundation for optimally enhancing corporate value in accordance with the client’s situation. - We offer a broad range of corporate value-related expertise, ranging from M&A and system design to CSR. - We provide services by fully utilizing our specialist knowledge and abundant experience with various types of management systems. Kodansha Business Partners Co., LTD. Increased capital to 13 million yen and reorganized as Crossfields Co., Ltd. Copyright © 2017 Crossfields. All Rights Reserved.